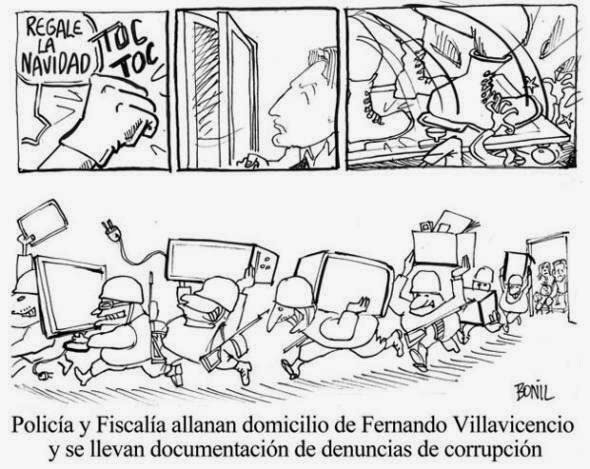 Some troubling media regulations that were passed in Ecuador last year are apparently being employed against political cartoonist Xavier Bonilla, who may face trial over a panel that ran in the newspaper El Universo and offended President Rafael Correa. Bonilla told Agence France-Presse that he does not yet know the exact charge, but early this month he received “a notification that mentions a report allowing a case against me.” If convicted, the cartoonist could be fined and forced to publish a retraction and/or apology. Both Jiménez and El Universo have previously been prosecuted for insulting Correa. According to the University of Texas’ Journalism in the Americas project, government attacks and intimidation against the media in Ecuador have increased exponentially in recent years. Somewhat ironically though, it was also Ecuador that offered asylum to Wikileaks founder Julian Assange, who has lived in the country’s London embassy since June 2012. Obviously, Correa and his government are not as committed to freedom of the press at home as they claim to be on the international stage. Assistant Web Editor Maren Williams is a reference librarian who enjoys free speech and rescue dogs.